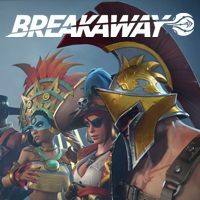 Developed by Amazon Game Studios, Breakaway is an original game set in a mythological world that combines elements of sports and brawler games. Breakaway for PC is an original combination of a brawler and sports games set in a mythological world. The game has been developed by Amazon Game Studios and, along with 2 other games – Crucible and New World – are a commercial debut of the aforementioned studios. Breakaway’s gameplay mechanics build on matches between 2 teams, comprising 4 players each – a team that first manages to take control over an artifact hidden on the map wins. The game is oriented towards cooperation, dynamic gameplay, and streaming players’ efforts via Twitch. Matches take place on diverse arenas – featuring El Dorado, Atlantis, and the Styx River. Players get at their disposal a number of mythological and legendary characters, each one with unique abilities and the so-called ‘buildables’, which allow them to completely change the situation of the arena. Spartacus, for example, can summon a catapult that wreaks havoc among enemy units, the gunslinger Rawlins can lock and opponent up in jail, while Thorgrim is able to destroy a part of the arena with his hammer. Developers put a strong emphasis on the social aspects – it is clearly visible with all the clebrations, poking other players, and replays featuring best sequences. Moreover, players can always check their transmission’s stats and enable the audience to somewhat change the gameplay rules. The PC release of Breakaway features high-quality and colorful visuals. Matches are set in a 3D environment and are bound to satisfy the players, especially with its aesthetically diverse arenas, and character models that are rich with details. Expectations: 8.4 / 10 calculated out of 4 players' votes.